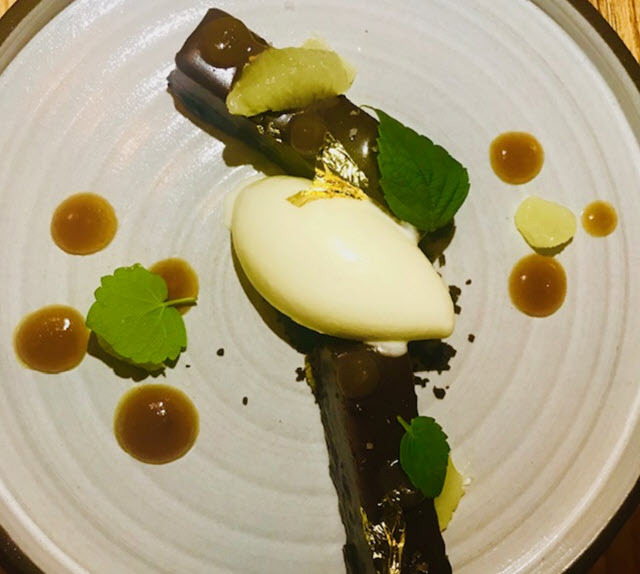 March activities, with a bit of overlap from late February, found us busier than the proverbial bee with restaurant openings, some changing chefs, and others embracing new menus. There were surprises and a single disappointment (it happens to the best of restaurants) – some that could be helped and others that couldn’t. 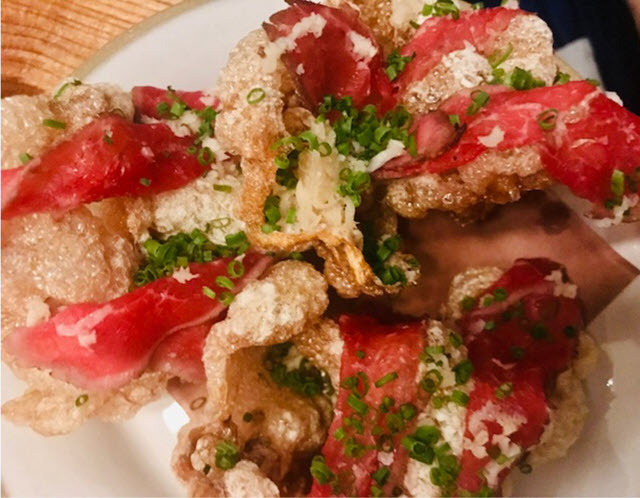 As Spanish cuisine continues its appeal across the DMV, Boqueria is a stunning recent addition to the Penn Quarter scene. (Their first location is in Georgetown). Though you’ll find many of the usual tapas on the extensive menu – pan con tomate, patatas brava (excellent here) and croquettas cremosas – there are many more unfamiliar and unique tapas. And that is how it should be. If you were bar hopping in Spain, and who isn’t, you’d find that every bar has its signature tapas. Escalivada is one such specialty and you will find it here. It incorporates fire-roasted eggplant with red pepper and onions slathered with labne yoghurt and is topped with fresh herbs and olive oil. Shrimp are an add-on. Speaking of shrimp, it’s my only complaint here. They are quite small, which means they cook too fast and become tough. Furthermore, they are served decapitated which omits the tastiest part. All the flavor and fat are in the head. I know you’ve heard my gripe about this American abomination of removing the tastiest part of the shrimp in past reviews. When I mention this unfortunate decision to chefs or servers, the answer I get is that diners are uncomfortable seeing the head on. Let’s change that. Otherwise, Boqueria is fantastic. A beautiful setting, sleek and chic, with light wood interior and a large bar laden with fruits, ready-to-slice Iberico ham and pickled vegetables. There are high tops with stools alongside the bar, which is fun if you’re planning on interacting with the bar scene, but I suggest you take a table or better yet one of the roomy booths in the back where you can spread out and watch the action in the open kitchen. The lighting is perfect. You can see your food and enjoy the shared camaraderie of the rhythm of the place, designed for people watching. Okay, it’s noisy, aka lively, but you can easily hear your dining partners. Sangrias by the glass or pitcher are a main feature of the spirits program. Don’t miss out, they are delicious. Some sangrias are standard fare, while others change with the seasons. And, rather than the usual wine-with-brandy base, different spirits form the base depending on your selection. Rosada, made with rosé, tequila, cranberry, pomegranate, and hibiscus-soaked strawberries is the perfect spring sparkler, and Naranja Sanguina, a seasonal option, is flavored with blood orange, cava, tequila, and lime cordial. Refrescantes start with Seedlip, the world’s first non-alcoholic distilled spirit and a story in itself, adds herbs and fresh fruit flavors. 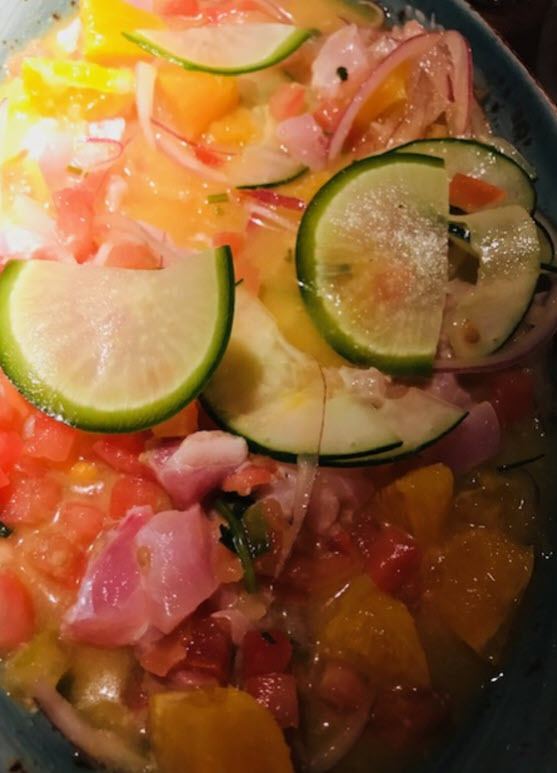 The menu has a lot of moving parts – the aforementioned tapas; an entire section devoted to Spanish cheeses and premium Spanish hams; meats; seafood; vegetables that include salads; and a chef’s menu, described as a “journey through the classics”. If you are really invested in the whole dining-in-Spain experience, you can order the Cochinillo Feast. Ideal for a table of six, it features a whole suckling pig with sides. Three days’ notice is required, so plan in advance. We enjoyed a number of these dishes, including tapas. All are served in large portions, enough to share. Ensalada de Hinojo y Peras, a refreshing salad of fennel, pears, and fried walnuts with a delicate citrus dressing, was more than enough to share and still have leftovers, as was Coca de Setas, a grilled flatbread with puréed porcini mushrooms, Idiazábal cheese, caramelized onions, wild mushrooms, and pine nuts and topped with a tangle of arugula. For now, pork- or seafood-centric paella is served only at brunch, as is an organic roast chicken, half or whole, accompanied by eggs, roasted root vegetables, and salsa verde. They are crazy for churros here and you will be too. 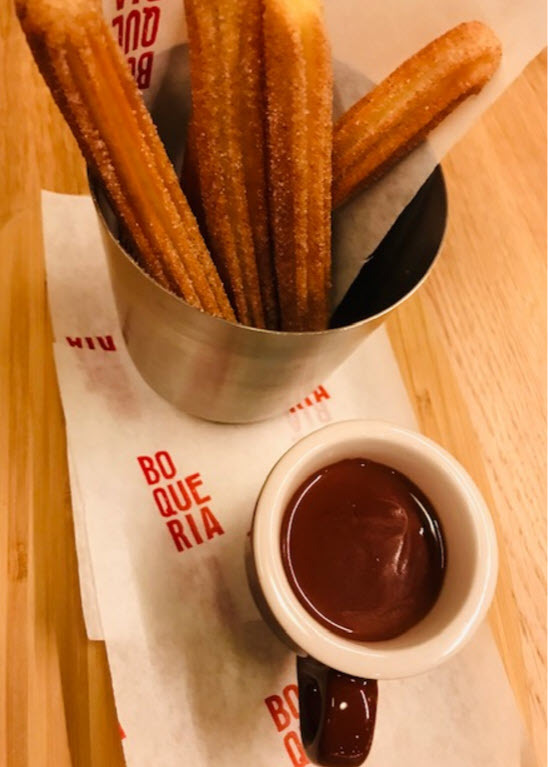 Crisp on the outside with a soft cake-like interior, they come traditional style, served with a ramekin of hot gooey chocolate for dipping, or filled with a choice of Nutella or dulce de leche. We watched in wonder as orders of unicorn-worthy Churros Ice Cream Sundaes were being carried around the room. These over-the-top, colorful concoctions boast churros, vanilla ice cream, chocolate sauce, dulce de leche, whipped cream, walnuts and rainbow sprinkles. Perfect for birthday celebrations. Boqueria – 777 9th Street, NW, Washington, DC 20001 in Penn Quarter. Boqueria has another location in Georgetown at 1837 M Street, NW, Washington, DC 20036. 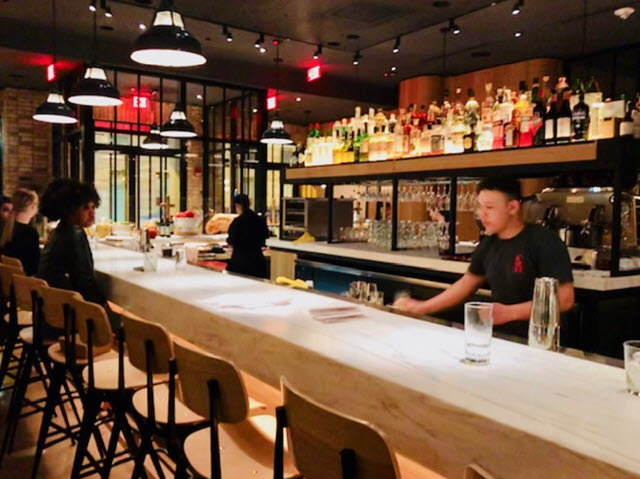 This King Street tavern, best known for its rowdy upstairs sports bar that offers shuffleboard, skeeball and live music after 10pm, has done a complete 180 degrees in its downstairs bar and restaurant with a stunning transformation. 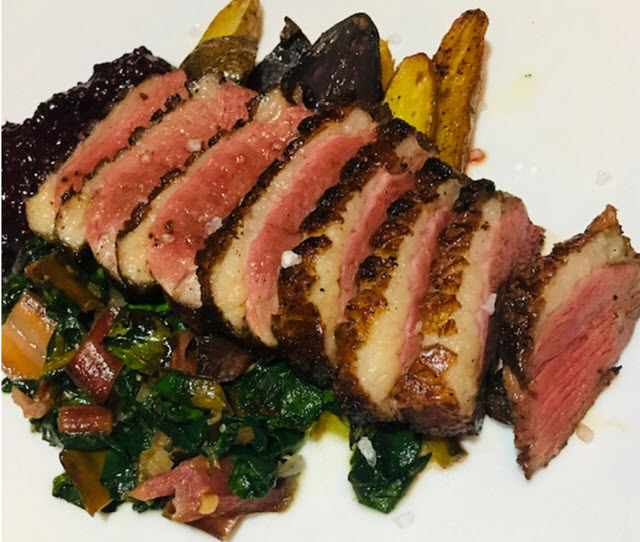 It’s owned by the same two brothers that launched Red’s Table in Reston – another popular eatery that hosts wine and beer pairing dinners. The owner was careful not to ignore the popular bar scene. 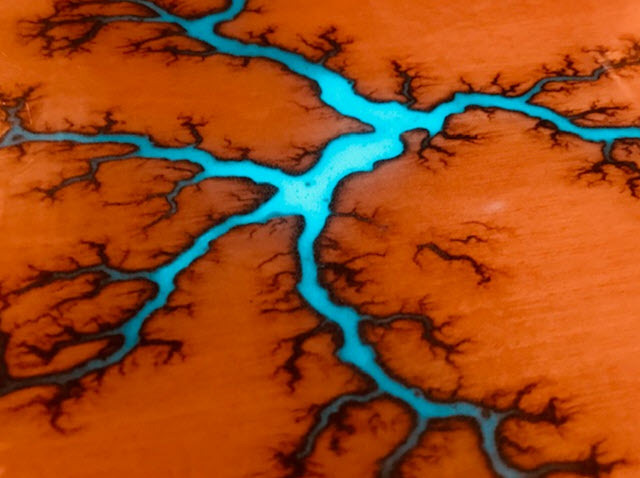 He just improved on it with a unique 38-foot bar that uses an eye-catching fractal wood burning technique, also known as the ‘Lichtenberg figure’ – a process of burning lightning or tree-like figures into wood using high voltage electricity. A bioluminescence material is then applied in the fissures causing them to appear to glow bluish bioluminescent plankton as seen in certain oceans at night. The backbar is made up of individual mantels John Jarecki found in antique stores and fitted together. Dining tables are made from old chestnut barn wood converted into tabletops. Original brick walls lend a historic note and light from the storefront windows afford diners a view of the activity on King Street. The rest of the décor is pretty too. Will guys go for the fabric-covered banquettes, candlelight and beautiful new bar? Or will they eschew such decorative niceties? Will they even notice? On the night I visited it seemed they would. A table of coed league soccer players were enjoying beers and a tableful of dishes after a game, and I ran into a group of tastemaker friends at the bar who told me they meet there regularly. Who knew? The food is still American Casual, but more flavor forward with generous servings, and quite affordable. Late last summer, Chafik Hocine was called in as consulting chef. 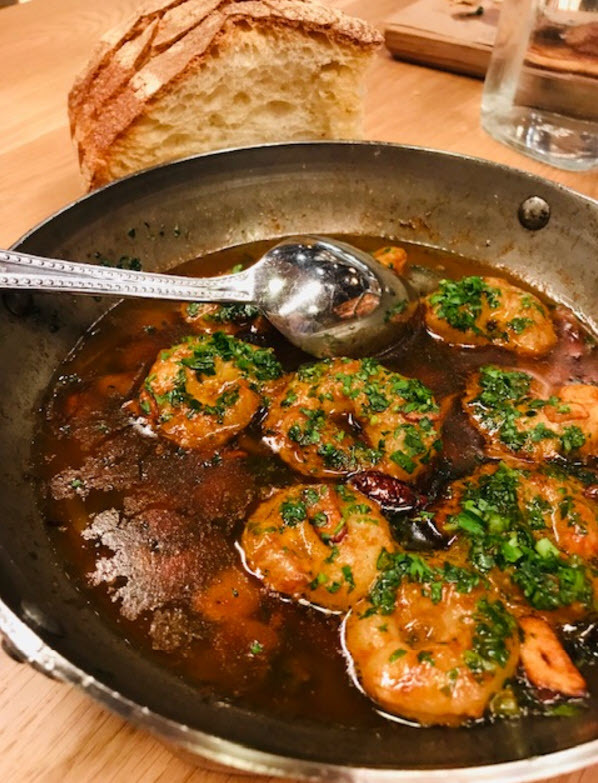 Hocine’s menu is heavily influenced by his Northern African roots and informed by traditional French cuisine and exposure from his travels to Vietnam, China, South Africa and Morocco. A native of Kabylie, Algeria, Hocine grew up in a small, self-contained mountain town, where he learned the value of incorporating fresh, locally-sourced ingredients into his dishes as well as creative improvisation. 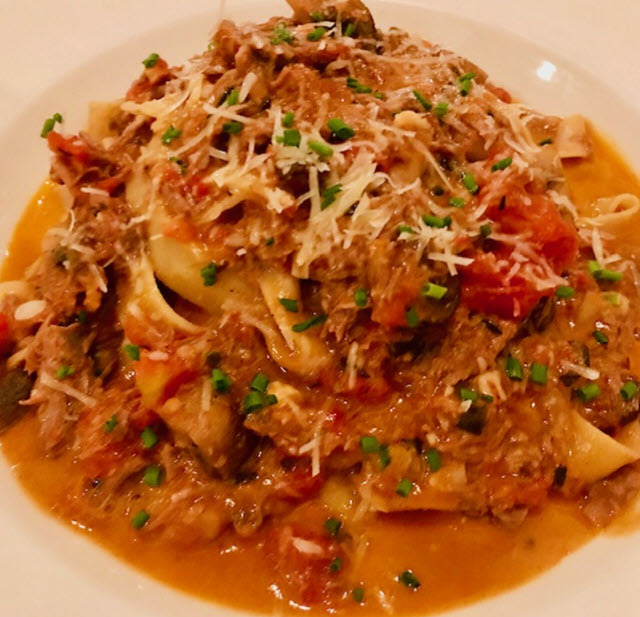 Though you can still order full-sized entrées – a gorgeous seafood stew chockfull of half a lobster, shrimp, clams and mussels, or steak frites, a 10-ounce strip steak with house cut French fries – I chose a delicious braised lamb ragout on pappardelle that was sheer bliss. 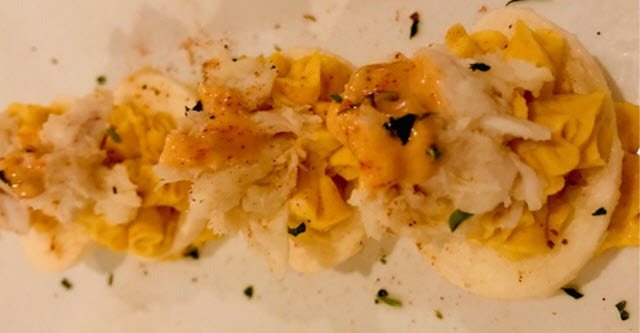 And though the décor now speaks to fancier dishes, I think the more successful dishes will be generously-portioned starters like Crabcake on Brioche, Fried Crab Deviled Eggs, and a delectably smooth chicken liver paté with accompaniments. Burgers made with dry-aged beef from Roseda Farms, and a Rolled Oat Mushroom burger for vegetarians (hold the gruyére for vegans), six kinds of salads and snacky things like pulled pork nachos, fried quail with spiced cauliflower purée, and mussels four ways. All dishes are suprisingly well-priced. Cocktails are listed as ‘Fun’ or ‘Fancy’ indicating an awareness of the mix of patrons the restaurant expects to please. “Black Betty’, in the Fun category, is only available after midnight with a limit of two per customer. I don’t claim to know what that is all about, but it could prove interesting. The cocktail menu rotates ,and I noticed a recent Spring drink called Pixie Rainbow Fancy Bubbles with edible glitter, house-made flavored sugar cube, bubbly and Green Hat gin. Send in the unicorns! This sounds magical! On a chilly evening, I opted for the Hot Buttered Scotch made with Glenlivet Founders Reserve (It can also be made with Captain Morgan Spiced Rum), just the thing to warm the cockles of your heart. 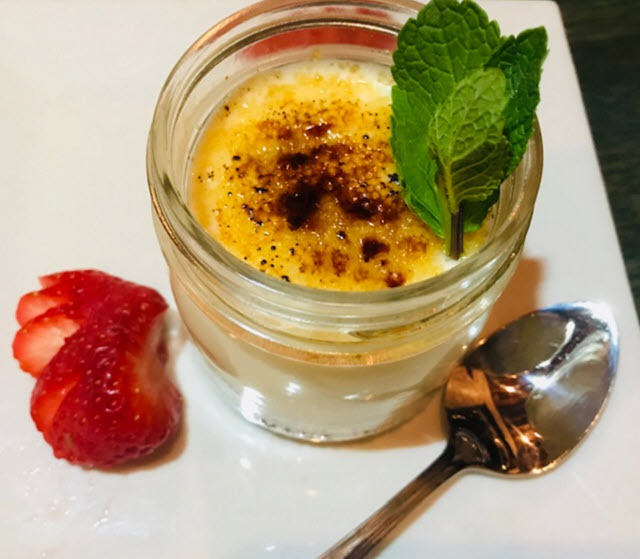 Most impressive about this centrally located spot on Old Town Alexandria’s King Street, are the large portions and charming, cozy ambiance, and there seems to be something on the menu to satisfy “fun” or “fancy” tastes. The Light Horse – 715 King Street, Alexandria, VA 22314. I am mad as a wet hen. Shortly after its opening, a well-known local restaurant critic trashed this restaurant, complaining about the cuisine, that food came out too fast for his liking (usually the complaint is the other way round), and thus defiling a celebrated Mexican chef’s reputation. It was totally unwarranted, and I couldn’t disagree more. As a testament to its success, the place has been packed with waiting lines of up to an hour on weekends. Thankfully, they take reservations. First off, this is not your mother’s taco joint, though tacos are served. It’s serious Mexican cuisine, with moles that take up to three days to prepare and the use of unique ingredients like the unusual chicatana ant sauce served with tiradita pork belly. Organic huitlacoche (a delicacy often described as ‘Mexican truffle’) is used in cooking, and five varieties of corn are flown in direct from Mexico and ground on site. The food is beautiful, fresh and authentic. 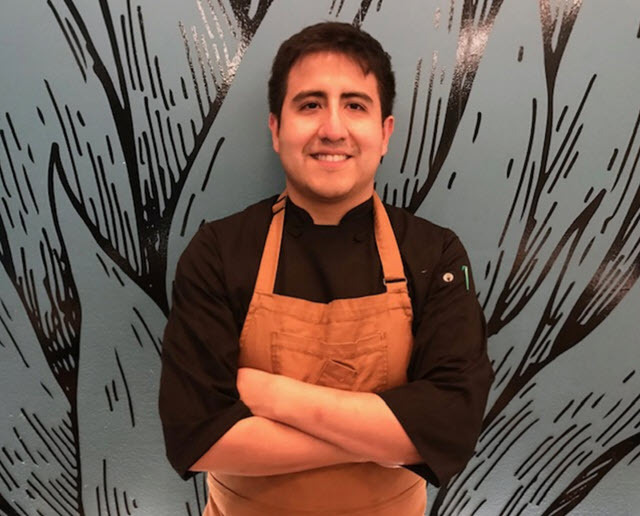 Oaxacan Executive Chef Alam Méndez Florián, who left Mexico to helm this new restaurant, is in the kitchen every day. The award-winning chef doesn’t merely jet in to consult on the menu, he relocated here. In Mexico City he enjoys a stellar reputation at Pasillo de Humo, a restaurant always packed to the gills with fans of his cooking. Also noteworthy: Alam’s mother is one of Mexico’s best loved chefs, Celia Florián, is the leader of the Slow Food Oaxaca movement and an expert in traditional Oaxacan cooking. Celia, who often cooks with her son, taught James Beard Award-winning chef, Pati Jinich, the art of Oaxacan cooking. Alam and his mother are considered Mexican culinary royalty. I can honestly say that the seviches were the best I have ever had, here or Mexico, and you won’t go wrong whether you order the Ceviche Amarillo with rockfish, ginger, lime, orange, yellow pepper and pico de gallo or the Shrimp Ceviche with avocado, cherry tomatoes, cucumber, pico de gallo, chile de arbol, cilantro, and carrot (the finely shredded carrot adds a sweet balance to the acidity). A unique starter, Plantain Molotes, is a typical Oaxacan dish consisting of round balls of mashed plantains. 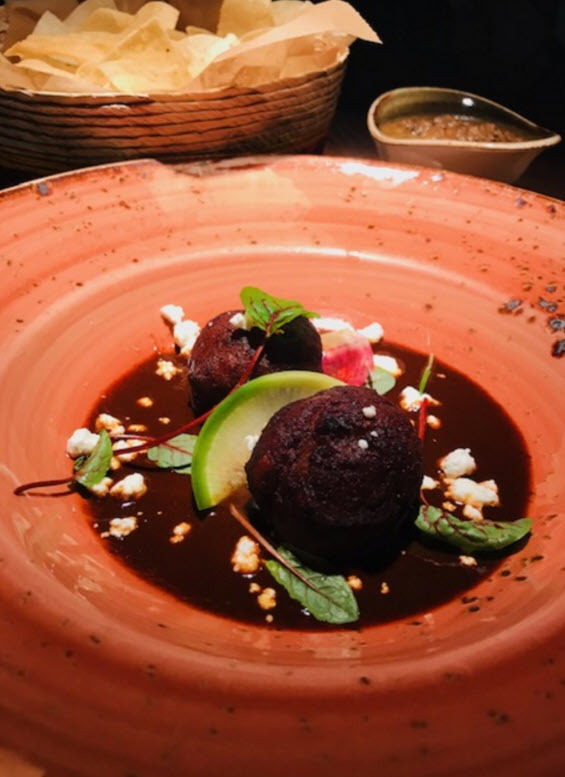 Usually the beans are inside, but here they are stuffed with goat cheese and served with a complex mole coloradito that incorporates roasted tomatillos, cinnamon, guajillo and ancho chiles, and bittersweet chocolate. You’ll find deeply rich moles here that are epic. 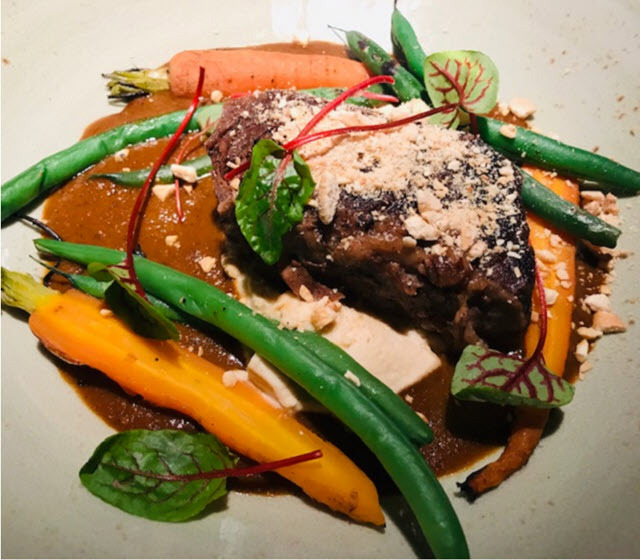 Try the Braised Short Rib with almond mole, the tender beef falling off the bone. For vegans, a Cauliflower Taco adds cashew mole. Sumptuous! There eight types of tacos and two types of tostadas to choose from. All are made with heirloom corn. Happy Hour finds these yummy small plates at half price with gratis wafer-thin chips and smoky salsa. Drinks are discounted as well. 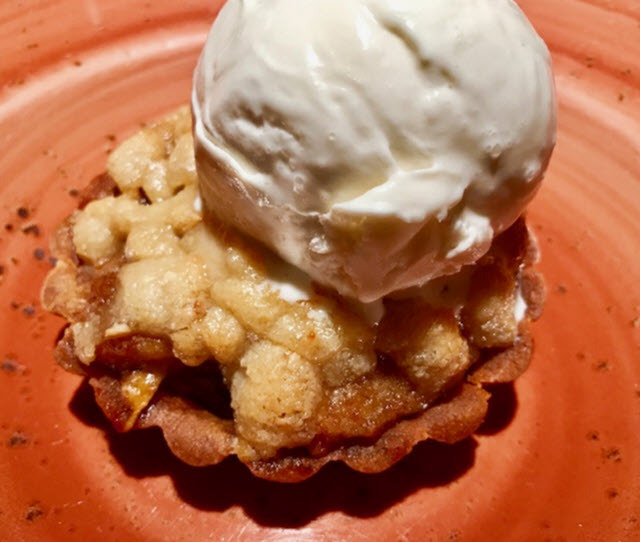 Desserts are not a mere afterthought in this stylishly hip space that honors the tradition of lucha libre, Mexican wrestling. 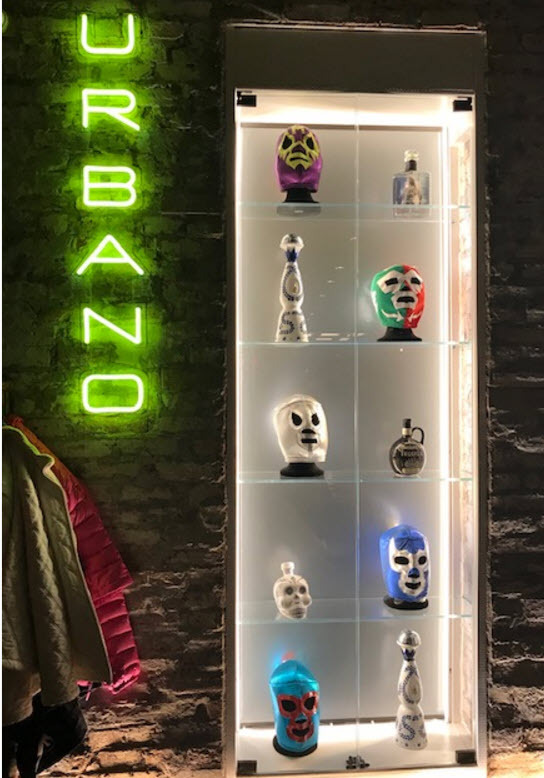 (Be sure to check out the luchador masks, housed in glass cases.) Chocolate is as revered here as it was for the ancient Mayans. 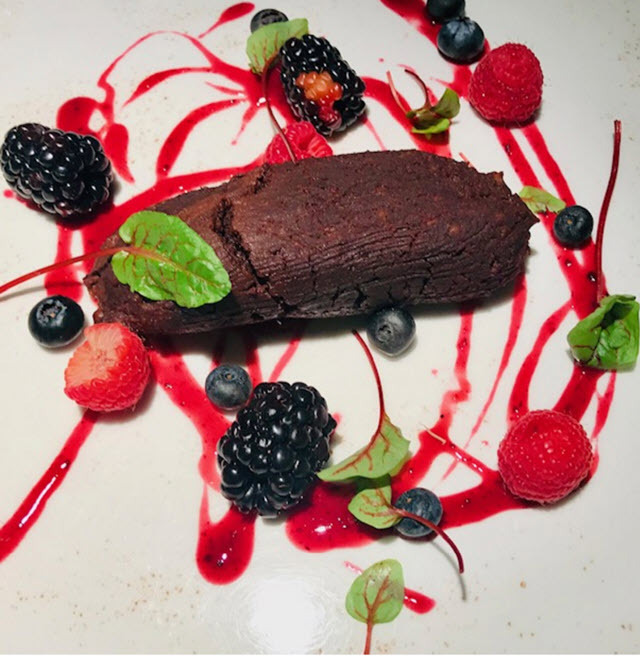 Try the steamed Mexican Chocolate Tamal prepared inside corn husks and served with mixed fresh berries, or the delicious Banana Mezcal Tart with its tender crust and cashew crumble topping. A new Spring dessert is Mendez’s lip-smacking Trés Léches Cake. Urbano 116 – 116 King Street, Alexandria, VA 22314.
Who are we if not seekers of the hottest, hippest, edgiest scene? We try. 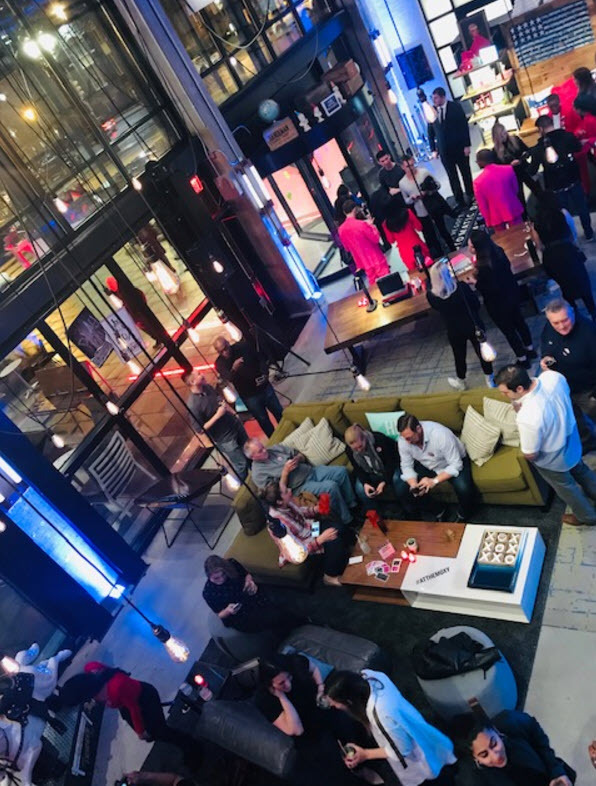 The opening of DC’s Moxy Hotel brought out all the influencers and their devoted followers to this hip, new property. 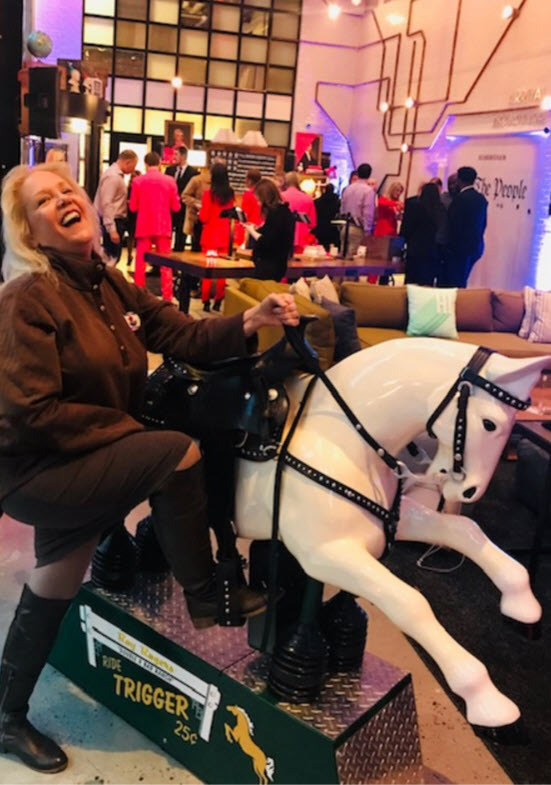 When your lobby is half bar-half lounge with a dime store pony to ride, you have landed in the Moxy. Billed as “Fun, Play & Scandal” the place was pumped when we were wowed by a fabulous entrance decorated with pink flamingos and a crowd that was rocking to the sounds of DJ Farrah Floscett. 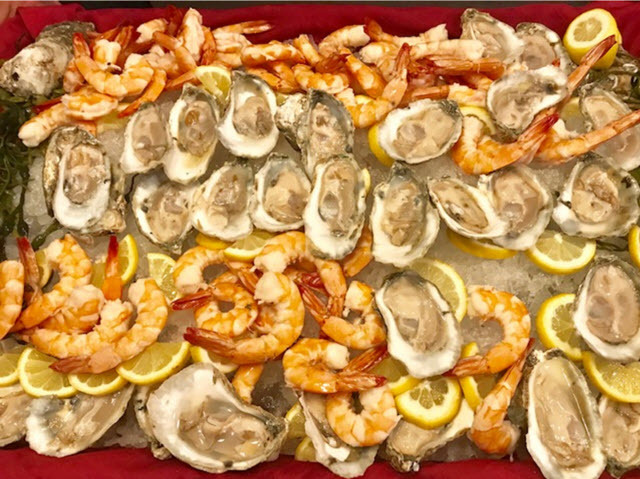 Tables overflowed with huge displays of iced shrimp and oysters, sushi and sliders and a reach-in fridge filled with lobster rolls, sashimi, tuna tartare and morel-topped vegan cucumber rolls. Hot pink rubber ducks (hot pink is the prevailing color here) stood guard over an eclectic American flag décor. 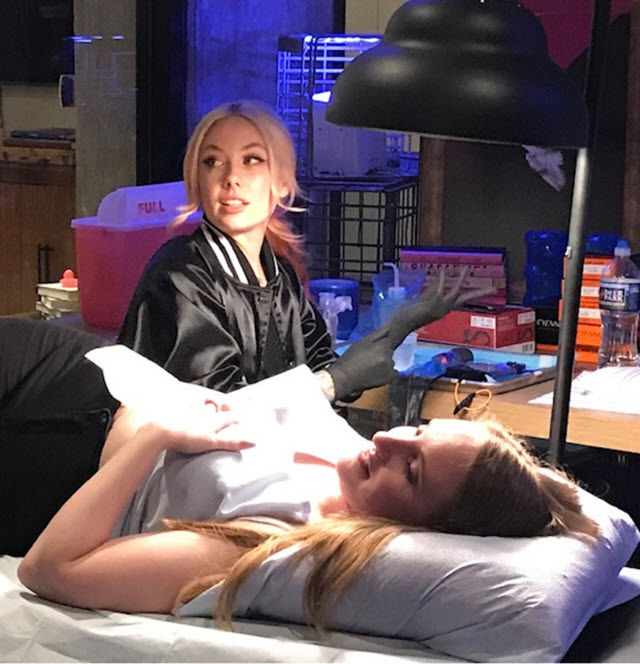 Amid all the hubbub, celebrity tattoo artist Megan Massacre of Netflix’s Bondi Ink Tattoo Crew was inking a growing line of fans. Paste-on tattoos were offered for those of us who eschew the permanent kind – or anything involving pain for that matter. A glassed-off playroom in the upstairs loft space that overlooks the lobby, houses a giant Jenga, a foosball table and ping-pong. Beside the upstairs bar is a romantically-lit niche for lounging that’s cordoned off by a beaded curtain. It’s perfect for private convos… or whatever you don’t want to share. The hotel offers free wi-fi with plug-and-meet gathering spots, as well as a fitness center, a barista station with fresh baked pastries, craft cocktails and flatbreads in the evenings, and a pet-friendly policy. Moxy by Marriott – 1011 K Street, NW, Washington, DC 20001. A night was planned to dine at Bresca. 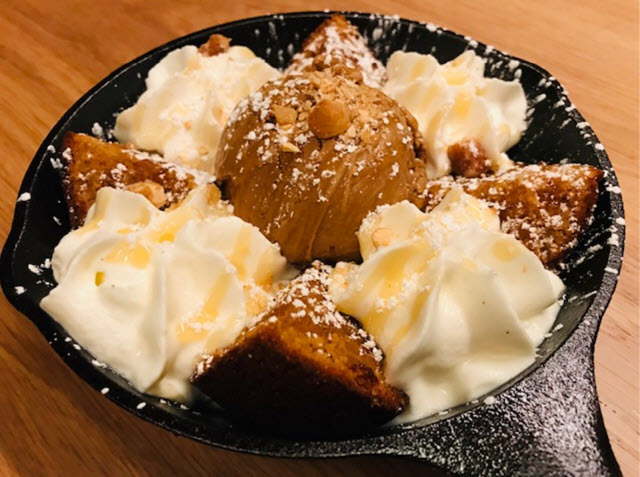 Two couples who wanted to catch up and enjoy what has become one of the most popular restaurants in DC thanks to the culinary stylings of Executive Chef Ryan Ratino formerly of the briefly-open Ripple and a quaint country inn in White Post, Virginia. Despite its single Michelin star and a plethora of praise-worthy reviews, all did not go as hoped for. Reservations were made for 7pm and we arrived on time. Cocktails were ordered. Strangely, a martini ordered through the manager, arrived as a glass of white vermouth straight up – without a hint of gin. After that was sorted out and replaced with an actual martini, we placed our dinner orders – or tried to. At 7:15 they were out of the Rohan duck. Little did we know that only four orders of duck are prepared each evening. Okay, good to know. Forgo the duck. The Scallop Mi-Cuit was heavenly. 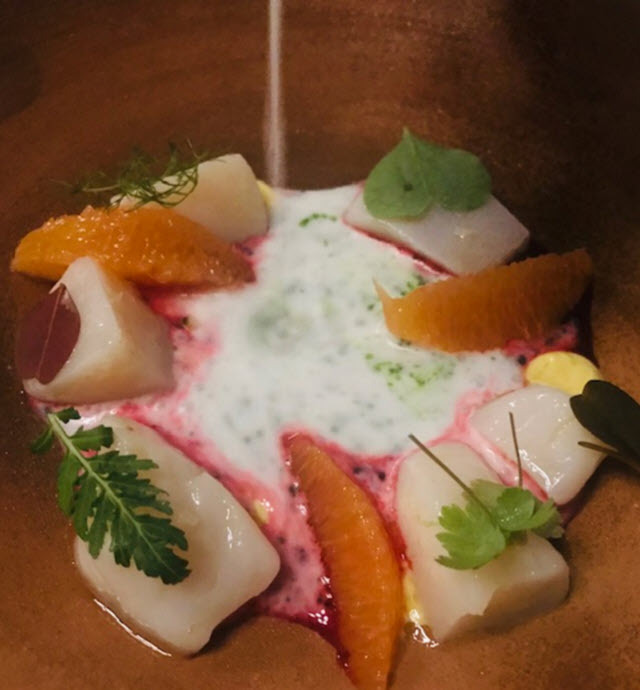 Raw slices of scallop and cara cara orange supremes garnished with wild laurel and enhanced by a tableside pour over of leche de tigre. Another dish that went quickly was Burrata & Winter Citrus, lively with cream-centered mozzarella, and prettily served with radicchio, herbs and flowers, and aloe marmalade. We opted for an order of Seylou Bakery’s Einkorn bread with chartreuse (not discerned) and wild fennel butter – slightly licoricey. This bakery makes some of my favorite breads, but the Einkorn is a very dense, fermented bread that, though delicious, seemed overwhelmingly intense for this refined cuisine. Another starter, ordered by my Hungarian chef friend, was the Smoked Potato Pierogis. These were not delicate potato-based, cheese-filled, prettily-fluted Polish dumplings, but were dense and dreary. 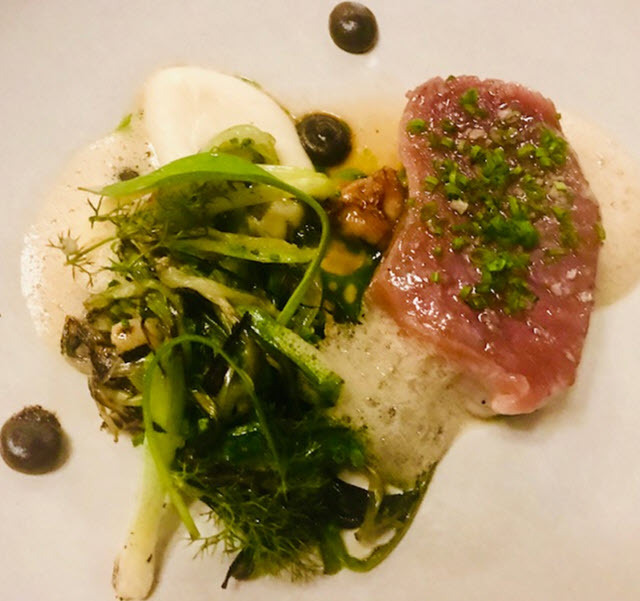 Nonetheless, I had high hopes for my entrée – Tuna with sweetbreads, wild fennel and black garlic. After all, my scallops were lovely. Sadly, the tuna was prepared sous vide minus a char finish. It tasted as if it had been boiled with no noticeable seasoning. Yes, it held a rosy inside as sous vide promises, but it was utterly flavorless. I was hungry. I ate it. The excited-for sweetbreads amounted to less than a teaspoon of tiny chopped up sweetbreads cooked to death. Oh, dear. Around 8:30 the music, already pretty loud, turned to hard rock and since we were already yelling across the table to be heard, we paid and left. Would I recommend it? Not as a complete dining experience. Though I like Ratino’s creativity, it left us flat. Bresca – 1906 14th Street, NW, Washington, DC 20009. 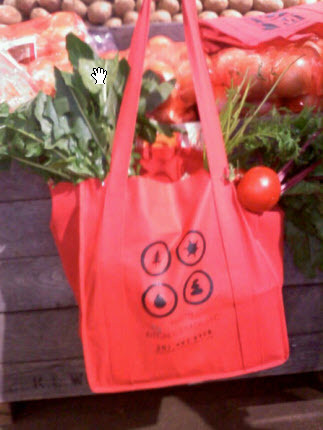 Eco-Tote Bag with Vegetables and Root Plant acquisitions. After six years of running a successful farmers market in Merrifield, Virginia, Central Farm Markets is moving their Merrifield location to the George C. Marshall High School at 7731 Leesburg Pike, Falls Church, VA. This location is closer to I-495 and more accessible for McLean, Falls Church, Fairfax, Vienna and Arlington patrons. The farmers market will be renamed NOVA Central Farm Market to better reflect the new location. 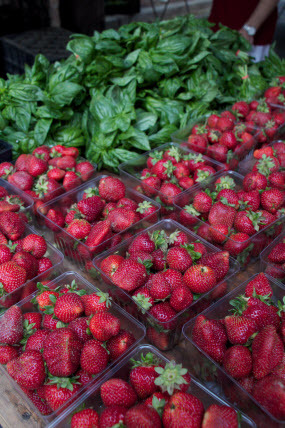 The new market will operate every Sunday from 8:30am till 1pm. “Our Northern Virginia location was named a Best for Families Winner for 2018, by Washington Family Magazine”, says Mitch Berliner, founder of Central Farm Markets. “ We believe our new location is easier for parking and more centrally located for all of our Northern Virginia patrons”. April 14, 2019 is designated George C. Marshall High School ‘Griffen Day’ and 5% of sales will be donated to the High School Booster Club. 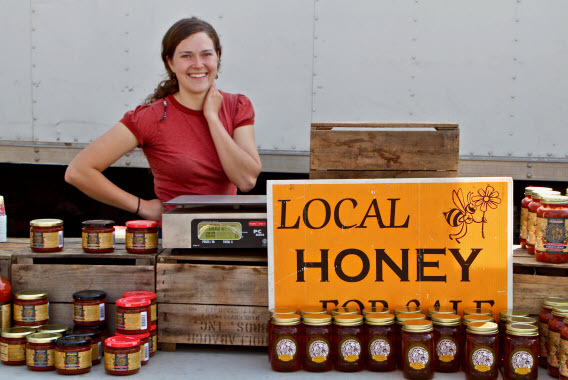 NOVA Central Farm Market will continue to present the outstanding programming as it does for all of its farmers markets in the Washington area featuring lively music programs, chef demos, kids’ activities, pie contests and more. Central Farm Markets will continue the food gleaning partnership with Food For Others and continue to host for free local non-profits serving area patrons. Music by Roan Gap – enjoy traditional bluegrass and some crik pickin’! Kids Club – kids decorate your own beach ball!